It is imperative that we address the risk of attacks through our external trade links. Instrumentation moves us toward total asset visibility and authentication. The recent threats to the American people from various foreign groups, and the examples of the World Trade Center, Pentagon, and other attacks, indicate both a desire and an ability to carry out terrorism on both U.S. and foreign soil. This situation is exacerbated by the increasing worldwide trade in arms and the unaccounted-for nuclear materials of the former Soviet Union. Thus, the need for increased homeland security is evident, and the need to address the risk of attacks through our external trade links is imperative. Fortunately, the technology now exists to assure the integrity of potentially threatening shipments. This paper describes some of the issues, as well as possible solutions for assuring container integrity from point of origin to final destination. 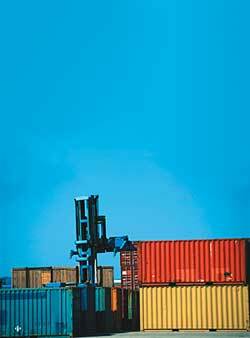 Many ports, customs, and private companies are focusing on security by pursuing security measures at ports. Currently, typical container inspections involve large radiation detectors costing $1-2 million. Additionally, these devices require operators, adding to the cost while limiting container throughput. While most cranes can unload containers at a rate of more than 30 per hour, radiation screening limits the process to about 20 containers per hour. This prohibitively decreases productivity. Unfortunately, U.S. ports have the capacity to screen only 2-4 percent of current container traffic. Other initiatives, such as the Container Security Initiative (CSI), rely on foreign cooperation with U.S. Customs agents. While 19 of the 20 foreign megaports (which account for nearly 60 percent of annual container shipments to the United States) are participating, U.S. Customs agents have no authority over these foreign ports. Also, many low-volume/high-risk ports are not participating. Finally, the 24 hour rule5 has affected few containers shipments (only 260 containers had been identified for violations for the three-month period ending April 29, 2003, and most were still shipped on time; some 2.4 million containers were checked during this period6). Although it has eliminated vague container manifests, there is no assurance manifests are now accurate or that weapons of mass destruction cannot be smuggled into the United States. In practice, Customs appears reluctant to hold up containers that fail to meet the 24 hour deadline, limiting the rule's effect on shippers and carriers. Port-based security initiatives still may allow high-risk cargo to leave foreign ports without inspection, meaning high-risk cargo could arrive at a U.S. port undetected. Even more problematic, green-lighted cargo is not inspected. As the terrorist attacks of 9/11 demonstrate, terrorists are willing to obey laws and regulations until the point of attack. If terrorists use containers to ship a nuclear or dirty bomb into the United States, it is likely they will follow proper procedures until a smuggled device is detonated. Therefore, the appropriate security solution involves tracking of all cargo containers before they reach U.S. soil. The first step toward improving container security lies in managing shipping contents and tracking movement. The Strategic Council on Security Technology, an industry consortium of 65 companies, has initiated a pilot program for Smart and Secure Tradelanes (SST). One pilot is using small radiofrequency identification (RFID) tags for tracking and coordinating shipments using an architecture pioneered by SAVI Technologies. Another solution uses electronic "seals" to detect tampering and uses technology developed by All Set Corporation. Though RFID tags and electronic seals serve a purpose, they are not a complete solution. What is missing from these solutions is chemical and radiological sensors inside the containers to continuously authenticate and referee the contents. Why Add Chemical and Radiological Sensors? Although electronic seals provide assurance the container has not been opened once sealed, they are not a complete solution. It is still possible the seals could be misused by introducing hazardous cargo into the container prior to "sealing" or the container could be violated through an "unsealed" opening away from the seal and RFID. RFID seals also can be reset after unauthorized openings, container doors can be removed and replaced without breaking the seal, and hazardous material can be introduced by forced entry through the side of the container. Finally, seal readers would have to be installed in multiple locations outside ports, increasing costs. A higher level of protection comes from actually monitoring the contents of the container with radiological, chemical, and atmospheric sensors with global positioning capabilities. The current generation of radiation and toxic chemical sensors, when incorporated with a wireless data network, will move authorities closer to detecting both intrusion and the transportation of weapons of mass destruction, toxic materials, or actual terrorists. When married with a wireless data management system, ports could be assured of secure, referenced, and monitored cargo. Theft Detection: Sensors pinpoint the time and location for any container intrusion and communicate events in real time to carriers and shippers. Supply Chain Visibility: Each container is monitored by GPS, allowing real-time location tracking worldwide. Cargo Monitoring: A container's environments can be monitored for radiation, toxic chemicals, light, heat, motion, shock, and other changes that may potentially damage cargo or indicate violations of container integrity. Stowaway Detection: The presence of unauthorized personnel, such as terrorists or illegal immigrants, is detected, decreasing repatriation costs for vessel owners. Insurance Reductions: Because of theft, damage, and tampering reductions, insurance premiums will decline. Of the benefits identified, theft tracking and deterrence could have a major financial impact on shippers, carriers, and insurers. By pinpointing when and where thefts occur, companies can identify the most vulnerable parts of the supply chain. Similarly, real-time location tracking can help firms better understand the cost and timing associated with specific transportation segments, allowing companies to optimize the supply chain from both a cost and security standpoint. Finally, the third beneficiaries would be ports and Customs (along with other Homeland Security-related organizations). Container sensors monitor for nuclear and chemical weapons in a less expensive and more efficient manner. Real-time container information can be transmitted to Customs' computer model in Springfield, Va. from anywhere in the world. This would reduce the need to put customs agents in foreign ports (as CSI is doing) and eliminate the redundant screening of contents. Ports could operate at full efficiency. Radiation monitors are available that use a unique scintillating crystal combined with a photo-diode detector in a compact, pager-sized unit. These detectors, already certified by the International Atomic Energy Agency's ITRAP study (Illicit Trafficking of Radioactive materials Assessment Program), are smaller in size and weight than conventional Geiger-Mueller tubes and have very low power requirements. The detectors measure both gamma and neutron rays. Gamma rays are emitted from most types of radioactive materials and pass through most common materials. Therefore, a gamma-ray detector is useful to warn of a general radioactivity hazard. However, it is possible to shield gamma rays with a few inches of lead metal. By contrast, neutron rays are emitted from very few legitimate sources and are a strong indicator for weapons-type fissile material. Neutrons are not stopped by lead metal and require a few feet of material such as water or concrete to hide them. Such a container would be very difficult to conceal physically. Therefore, a neutron detector is called for to detect illicit nuclear weapons materials. The miniaturization of photo-ionization detectors (PIDs) to measure volatile organic compounds (VOCs) at low parts-per-billion (ppb) levels has made available these broad-band sensors that detect almost any type of organic vapor, including such diverse sources as gasoline, ripening fruit, off-gassing from plastics, paints, carpets, hazardous waste, rocket fuels, and nerve agents. Each type of sensor offers a different level of protection and can used to detect different threats or container violations. Sensors can be deployed in an array that will detect explosive atmospheres, oxygen consumption, carbon dioxide production, carbon monoxide production, volatile organic compound concentrations, and chemical outgassing. For example, an NO2 sensor can detect a nitrogen tetroxide rocket propellant, which outgasses NO2 vapors. A PID can detect hydrazine rocket fuels, or other flammable fuels. An NH3 sensor can respond to an ammonium nitrate bomb made from fertilizers. A CO2 ensor will warn of the presence of a person inside the container. Even if there were no ability to detect specific compounds, chemical sensing would detect any changes in the cargo condition. During a long shipment, the chemical condition inside the container should be stable or drift slowly. Any sudden change in the detector response would indicate an alteration of the cargo contents and a possible intentional circumvention of the electronic seal. In addition to detection of threats, chemical sensors would have peacetime commercial applications. For example, transported food is usually fumigated with methyl bromide or phosphine (PH3) before transport. An electrochemical sensor for PH3 or a PID for methyl bromide could be used to ensure a residual fumigant is present, as required during the entire transport, in order to ensure the product is safe for consumption and undamaged upon arrival. Wireless technology has allowed stand-alone sensor monitors to be integrated into sensor networks, allowing a user to reference information in real time. This enables sensor data from individual cargo containers within a ship's hold to be monitored in transit, to detect when the integrity of the container is violated. For example, a cargo container holding paint drums may accumulate paint fumes at a constant rate within the container. If the container is opened, the fumes will diffuse and will reaccumulate when the container is resealed. Simple signal analysis of the raw sensor data can identify the gradual increases, sensor spikes/drops, etc. and correlate them with real-world events (e.g., container open) by referencing "baseline" behavior profiles, decreasing or eliminating false positives. Further, by cross-referencing the container manifest, these baseline profiles may be content-specific, allowing for varying expected chemical concentrations for different contents. Wireless sensor networks can enhance visibility not only in transit, but also at point-of-entry security checkpoints. The data may be logged and wirelessly transmitted along with a content manifest to port security. This gives the security checkpoint historical sensor, timestamp, and GPS data from the entire trip duration, not just a brief snapshot at the time of the security check. Automated software analysis can sort through the multitude of container data to "flag" suspect containers. For example, elevated CO2 levels may indicate a stowaway, while toxic chemicals can be detected by a PID. Wireless sensor networks are a reality, and the technology exists to provide continuous monitoring. The technology now exists to integrate advanced manifest data, sophisticated seals, and sensor data along with wireless networks to privide containerized freight integrity. The pilot projects that are currently underway will legitimize the seals; the next step will be to actively referee the contents of each shipment in real time at any location. However, the biggest challenge left is who will pay for these sensors? The protection and commercial benefits of container-based sensors are superior to port- or crane-based radiation detectors that cost millions of dollars. The most likely payers are: corporations, which may pay for sensors to obtain the commercial benefits, such as theft prevention and supply chain monitoring; carriers, which are likely to be pressured by large corporations that have a stake in assuring their brand is not associated with a terrorist attack on the United States; and, finally, Customs, which would decrease current inspection costs and streamline import processes while improving its ability to detect weapons of mass destruction. 1. Cargo Security Overview, Global eyefortransport Research, November 2002, page 23.2. O'Hanlon, et al. "Protecting the American Homeland, a Preliminary Analysis," The Brookings Institution Press, May 2002, page 7. 3. O'Hanlon, et al. "Protecting the American Homeland, a Preliminary Analysis," The Brookings Institution Press, May 2002, pages 13-33. 4. Cargo Security Overview, Global eyefortransport Research, November 2002, page 6. 5. The 24 hour rule requires manifest of cargo container content to be submitted to U.S. Customs 24 hours before the cargo can be laden on board a vessel. 6. U.S. Department of Homeland Security press release, May 1, 2003. This article originally appeared in the August 2003 issue of Occupational Health & Safety.